PF, STI (Wire threads), NPSM, NPSC, NPTR, NPSH, NPSL, NPSF, NPSI, NGT, MJ, UNJF, UNJC, DIN 2999, DIN 158 are some of the other types of threads which we also manufacture. We are one of the major traders and distributors of a vast assemblage of Thread Plug Gauges that can be availed in several specifications. Greatly demanded for their reliable performance and robust construction, these thread plug gauges are quite popular in the industry. These high functionality gauges are tested for their flawlessness before being delivered to the customers. We are supplier & trader of Measuring Pins.Measuring pins are manufactured based on relevant IS specification from graded steel. Range of manufacturing pins are from 0.5 mm to 3 mm with. 40 mm length and 3 mm onwards to 20 mm with 50mm length. 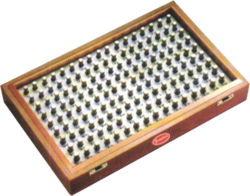 Pins are supplied loose, with knobs or in plastic container and set of pins in attractive wooden boxes. Tolerance of the pin is + 2 micron or ±1 micron , on diameter based on customers requirement. Generally pin sets from 0.5 mm to 12 mm are available in stock in increments of 0.01mm, 0.02mm, 0.05mm. Pins of special design and lengths can also be manufactured to customers specification. We are supplier trader of Adjustable Snap Gauges which are manufactured based on relevant IS specification, from 0-150mm. Body of gauge is graded cast iron. Block anvils adjustable anvils are manufactured from graded steel. Various steps of range are from 0-6 mm, 6mm - 13 mm, 13 mm— 19 mm etc. 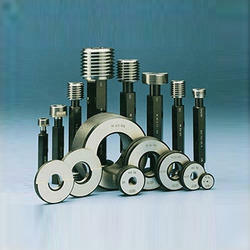 All gauges are manufactured as per accuracy specified in IS 7606-1982. We are supplier trader of Crankshaft Alignment Gauges.Crankshaft Gauge measures the Web deflection of a Crankshaft.Excessive web deflection is dangerous for the engine. The Cause may be faulty or damaged Crankshaft, damaged bearing, poor bearing alignment, excessive bearing clearance, or slackness, faulty flanging to transmission, flywheel or vee belt pulley etc. 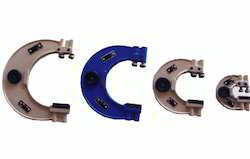 The BAKER Crankshaft Gauge is developed to identify avoid the above problems. The Gauge covers web-to-web distance of 60-600 mm. 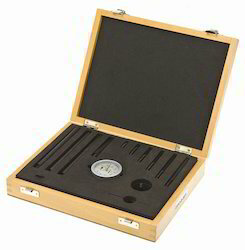 The set is supplied in a sleek wooden box. We are supplier & trader of Air Plug Gauge. 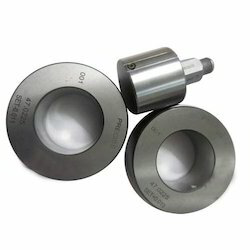 Quick and easy checking of bore size, taper & Ovality. With extensions to check deeper bores. Can be supplied to check though or blind bores. Can be supplied with multiple jets. Can be supplied specially to suit components. Can be supplied with Tungsten Carbide wear pads on request.